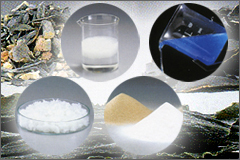 KIMICA corporation (KIMICA) is a manufacturer and worldwide supplier of "alginate" (alginic acid and its derivatives), which is a natural polysaccharide. Alginates are extracted from brown algae, which are in abundant supply in the oceans. KIMICA was the first company in Japan which, in 1941, successfully mass produced alginates on a commercial scale. Since its origin, KIMICA has managed to be a leader in the alginate market.